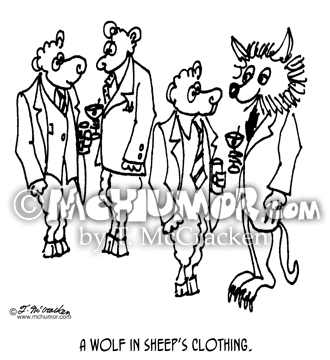 Sheep Cartoon 3346: "A Wolf in Sheep's Clothing." 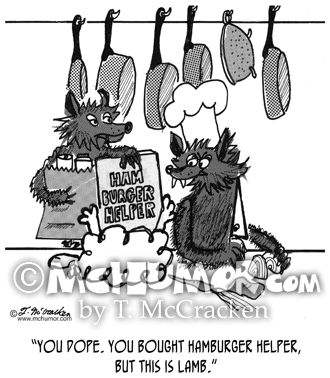 A wolf in business suits mingles with sheep in business suits. 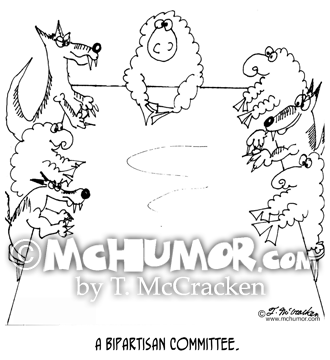 Sheep Cartoon 6716: "A bipartisan committee." 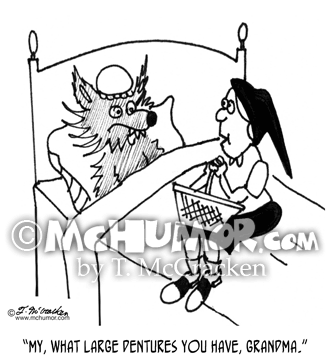 Sheep and wolves sit around a table. 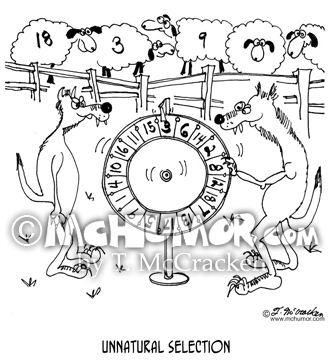 Sheep Cartoon 6970: "Unnatural Selection." Wolves with a roulette wheel spin to figure out which sheep they're going to hunt. Sheep Cartoon 6775: A battered sheep looking at coyotes in a line up says, "That's him. 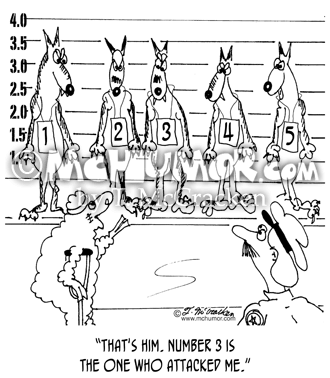 Number 3 is the one who attacked me." 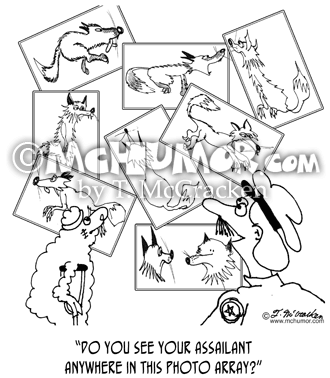 Fox Cartoon 3239: Looking at a bunch of pictures of foxes a police officer asks a sheep on crutches, "Do you see your assailant anywhere in this photo array?" 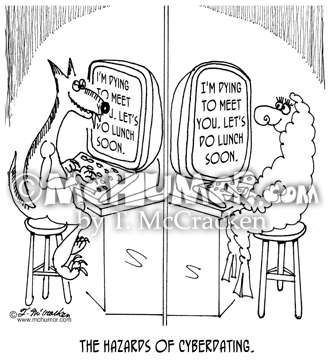 Relationship Cartoon 6770: Wolf e-mailing sheep, "So, I'm dying to meet you. 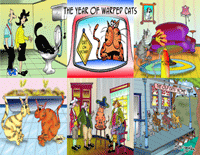 We really should do lunch sometime." 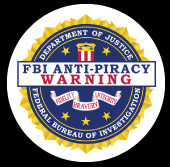 "The hazards of cyberdating." 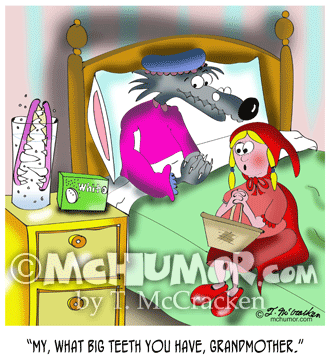 Werewolf Cartoon 0429: A dentist shining light on werewolf says, "It's strange. 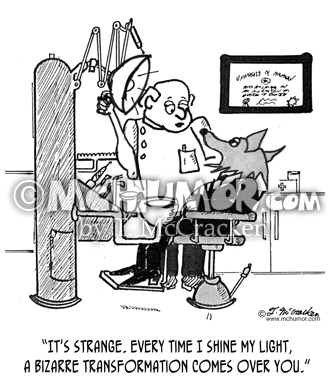 Every time I shine my light, a bizarre transformation comes over you."